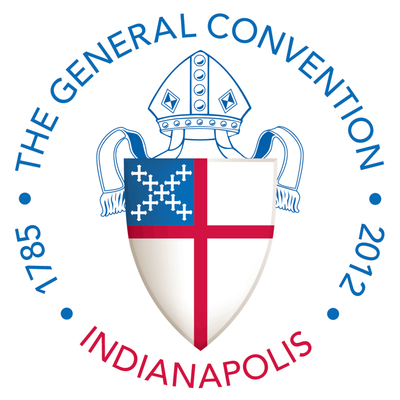 Some people think General Convention is the most important thing going on in the Episcopal Church. The Supreme Executive Committee disagrees, and we have ten reasons to prove that Lent Madness is better than General Convention. 1. Far from being limited to the shangri-la that is Indianapolis, Lent Madness is a global phenomenon. 2. Elections are truly democratic rather than foregone conclusions. 3. Having a Supreme Executive Committee eliminates mind-numbing non-supreme, non-executive committee work. 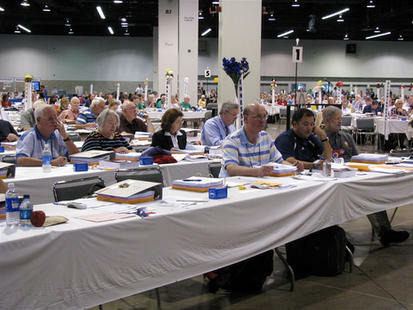 Voting at General Convention — snore. 4. Instead of boring names like Katharine and Bonnie, we have names like Enmegahbowh and Philander. 5. Lent Madness mugs rock. 6. House of Bishops? House of Deputies? We have the House of Tim and Scott (not that they would ever consent to live under the same roof). 7. We have a MUCH better logo (halo trumps mitre every time). 8. Who needs an exhibit hall, when you can go to the Lent Madness Store? 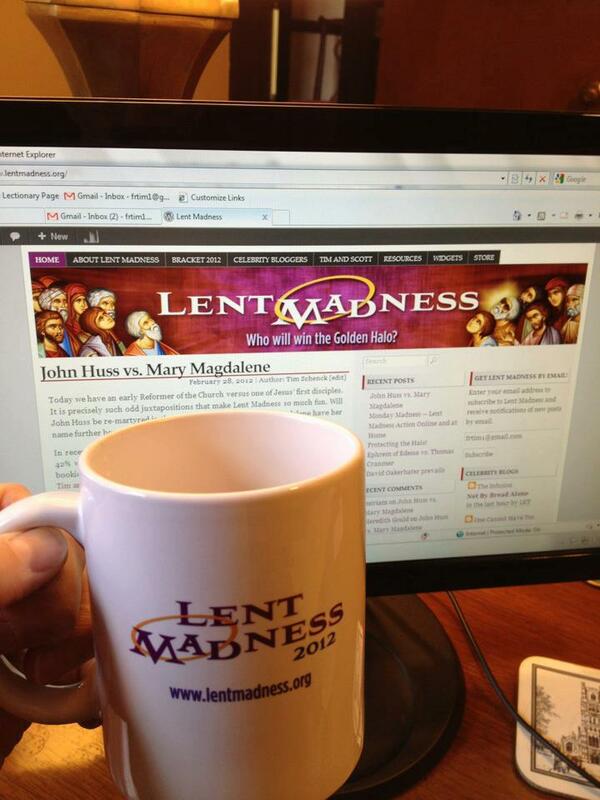 (with great merchandise on the way for Lent Madness 2013). Voting at Lent Madness — score! 9. Instead of 250 resolutions, we resolve things the old-fashioned way: 32 saints walk in. Only one walks out with the Golden Halo. 10. Ever hear an Easter sermon about a piece of legislation? Of course not. But I’ll bet a few of you heard sermons about the winner of the Golden Halo 2012. We have some ideas for how to make General Convention better and our ideas have nothing to do with restructuring or elections or numbered committees. Stay tuned for BREAKING NEWS on St. Alban’s Day for our plans to make this the best General Convention in the history of bicameral synodical assemblies. 32 Comments to "Why Lent Madness is Better than General Convention"
Considering that today is the summer solstice, it is a good time for a re-awakening of something or other in the Episcopal Church. It is sad that one of the main things I’m hoping for out of this convention is that we don’t publicly embarrass ourselves this time. PLEASE, guys and gals, please just don’t. where not everyone is thrilled by special interest agendas. Finally! Something that makes sense coming out of the Episcopal Church. I agree with Carolyn, too; I pray that we rediscover that we’re here to live out the Gospel and share it. It’s time and I’m not afraid to say it – there are so many more issues we have to be addressing! Ellen, my goodness! there are a lot of things coming out of the Episcopal church that make sense. Some of them include: 1) they ordain women(I used to be Catholic and it’ll never happen with them); 2) they’re gay-friendly(some of my best and dearest friends come from the LGBT community, can some of these other denominations make the same claim?) and they don’t tell you that birth control is a sin(See: Catholic). that’s just a few of the reasons I chose this denomination. that was over 2 years ago and I’ve not regretted it for a single minute. Madeline, if we Episcopalians aren’t Catholics as well, does it really matter who or what we ordain? I came from the intolerant other side of the aisle (virulent anti-Catholic) to find in the Episcopal Church a Catholicism that is coherent and inclusive, and that makes sense. I am no more willing to let RC’s steal the name Catholic, than I was in the Viet Nam era to to let war-mongering hawks steal the flag, patriotiotism and “God bless America” from the rest of us! Sorry about the “who” instead of “whom” in the second line! Laurie, can you tell the people who will be at General Convention and are 25 and under (THEY EXIST!!) places they should go, too? yes even at 33 I am not over the hill and will be there for 3 weeks! Anywhere downtown. It’s a cool place! Longing for Lent – I miss you and the other contributors. Is there another season you can invade? RoseAnn Evans has a great suggestion! *sigh* I was so hoping for Pentecost Passion! Ordinary Time can be so…well…ordinary! Happy Solstice! I, for one, did preach my last sermon that included a description of LENT MADNESS guaranteed to bring the Cathedral into 2013 fully aware of this most enlightening Lent activity. I may have to make one parishioner understand that we do not need to replicate LENT MADNESS, but just join in with what exists. He is indeed very smart but not that much. In other words, he ain’t nobody’s Tim Schenck! I am encouraging my rector to stop by your booth, and I’m sure it will be the most visited one at General Convention , to introduce himself and let you know I am the reason LENT MADNESS is known at Christ Church Cathedral. Is this a case of “sucking up?” Of course! I also expect my bishop to make his presence known to you also. This should be your biggest year at the convention and I am jolly well doing my da…uh..my best to make LENT MADNESS known to one and all. On to 2013 and more saints! Bigger saints! Better Saints! Oh, merciful heavens…this is what happens when I’m late eating breakfast. I can’t wait to hear your suggestions for improving General Convention, even though I’m not attending. And unlike General Convention that sounds kind of stuffy, Lent Madness even allows eight year olds like us to join in all the fun! 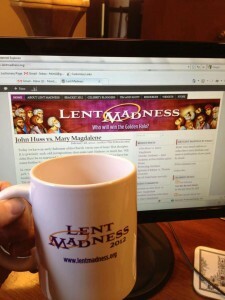 Hope you are taking a supply of Lent Madness mugs with you so people can really be prepared!!! So simple! A format for the future of General Convention? One could only hope. Lovely, but I still wish we could have the GC back here in Minneapolis again….soon. Would welcome your suggestions for improving GC, and I will be attending. This was just what I needed to get me laughing about what will likely be an unlaughable event. I was told watching haircuts, paint dry and rust form were more fun than a General Convention. Woo Hoo! Lent Madness 2013 is up and running! Can’t wait to hear more about your views and reviews on the upcoming General Convention. An idea to perhaps to make this year’s ecclesial gathering a little more exciting: The Episcopal 500! Have a car race like the Indy 500 & the drivers be bishops or a chosen representative of their diocese. Not sure either Scott or Tim will EVER make PB having a laugh at the GC like this. Tut. Tut. Enjoy your convention, folks! I’ll stay home (metaphorically) and look forward to Lent! Note to anyone preaching on July 22 — this will be an excellent opportunity to mention Mary Magdalene and her Golden Halo, as well as all of Lent Madness. Ironically, the Gospel for that Sunday points out that Jesus had compassion for the people who interrupted his “vacation” with the disciples . . . fair warning to clergy: stick with Lent Madness! So glad to see lent madness-related stuff in my inbox again!!! !still bummed out that Thomas Cranmer didn’t get the Golden halo tho’. Nice to see you online again. Thanks for your humor! « Monday Madness — Discerning the Bracket!